One day at a time. I find myself repeating this phrase more often each day. Since our last trip to Dallas, it seems as though time hit fast forward and all of a sudden here we are, making final preparations for baby Sam’s debut. These past few months, fear has been like the slow, steady drip of a leaky faucet in the back of my mind. Each night, I have faithfully emptied my basin of fears into the loving hands of my Heavenly Father. But then August hit and the faucet burst leaving my mind flooded by the chaos of moving life to Dallas. I find myself clinging to every moment in an effort to preserve time, especially as it relates to my son, Jack. Will I rock him in this room again? Will he miss going to preschool? Will he adjust to his new surroundings and being passed around to family members, if that time comes? Will he be the happy toddler I know now? How will I balance the needs of both my boys? Will he miss our time together? I know I will. I remind myself often. And sometimes God sends angels to remind me. A couple months ago, I connected with a mom on Facebook. Her name is Lindsay, and she asked if she could send me something. I agreed and soon afterwards, a small package arrived. I carefully opened it to reveal the Rustic Cuff bracelet pictured above. It’s lovely, to be sure, and my local friends see it on my wrist daily. But what is not readily apparent, hidden deep within this beautiful band, is the story of a journey no Mom would choose to take, yet one she would never regret. You see this bracelet was a gift given to Lindsay the day she laid her only child, one-month-old Aspyn, to rest. Lindsay knows emotional chaos…chaos I pray to never experience. And I bet she’s felt fear, even now as she prepares for the birth of her son in just a few short weeks; yet, she sent this beautiful band of precious memories to me so my faith would grow and remain steadfast. Say what? Lindsay shared that at Aspyn’s funeral, she received this gift, but five others received the gift of a joyous eternity when they gave their lives to Jesus. Although this band’s hidden story took my breath away, I soon learned one additional gift awaited Lindsay…her son, Phoenix, is due on Aspyn’s birthday. For me, this bracelet is a constant reminder that God’s goodness and mercy is present in all circumstances, if we trust and have eyes to see. When I’m overwhelmed by the busyness of logistics for tomorrow, it reminds me to stop and be still in Him today. And when that homesick feeling sets in as we drive away towards Dallas on September 12th, it will remind me that we do not take this journey alone or without purpose. God is sovereign over all and has sent ministering angels to tenderly care for us along the way. Lindsay is one of those angels and so are YOU! One day this season of life will pass for me, but it will begin for someone else. Then I will allow this lovely bracelet to continue its journey, one day at a time. Not at all your situation, but I lived in France at 21, never having been away alone before, no Skype, no texts, no phoning except at odd hours through the concierge. A wise woman at church, a friend’s mother, told me to just take it one day at s time. It got me through. Beautifully written from the heart, Dacia. 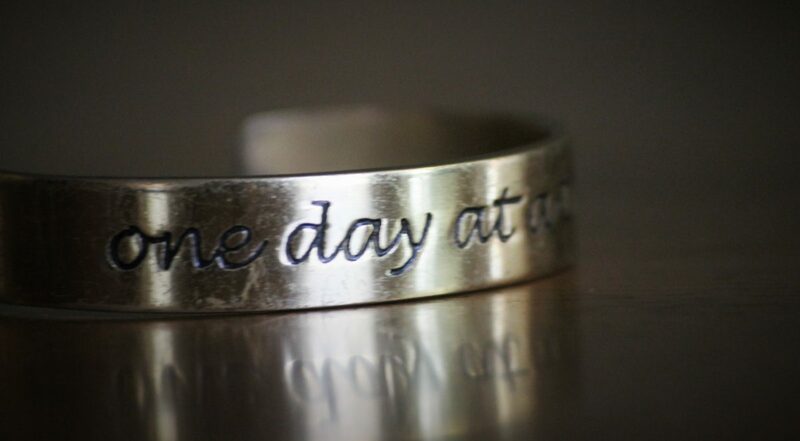 One day at a time is a life we all should be living for our Lord. What a blessing that God sent Lindsay to minister to you during ” such a time as this”!!! Thank you for sharing your journey. Thankful Lindsay wanted to share that cuff that binds you together on a similar journey. Your faith in God through this is your hope for the future. More importantly, lives are being changed because you choose to share God’s love in the midst of adversity. May you continue to feel God’s grace and mercies daily. Blessings. Dacia, I’m praying for you and your sweet little family and especially for little Sam. Your faith is secure, and I pray that God guides your every moment and every thought. It is Ashley Reale from OC. I can’t begin to tell you that I know what you are going through so I am not even going to try. I want to give you a little peace. My birth date is June 28th, my actual birthday is supposed to be September 21st. I was born 3 months early and only weighed 2lbs, 3oz. I just walked across the stage in May to get my Master’s and got engaged in June. Don’t ever lose hope! I tell you this because it is going to be a challenge but I have been following your story and I have total faith that you and Mike will be fantastic. Keep your optimism up! That is the best thing you can do. I will keep you in my prayers! May these days full of uncertainty for you, Mike, Jack and Samuel, also be used of God to point many more people to their need for Jesus! He brings the joy of forgiveness and new purpose to our little lives here. Love you guys!